This is the official website of artist Darryl Daniels. 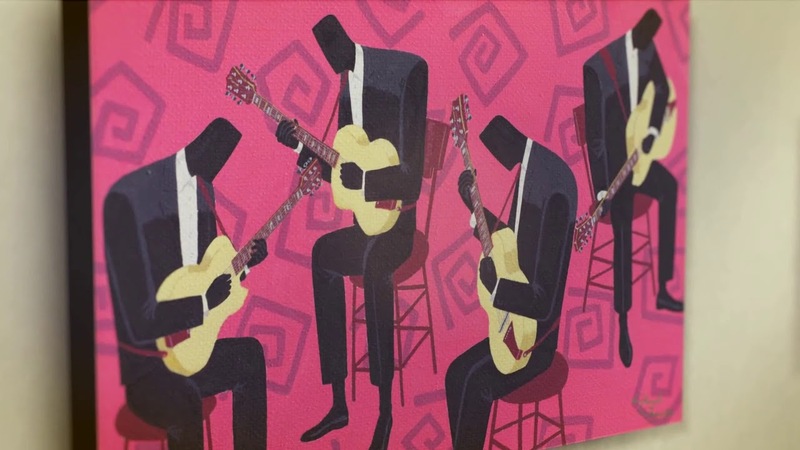 Learn more and purchase paintings and reproductions from The Jazz Men series. A devotee of the figurative style of art, Darryl Daniels decided to transform the drawings he was making to explore the spatial distance between the abstract figures into the jazz musicians in his signature series of paintings. It was part of an idea that Daniels had been exploring which fused the confluence of the Rohrschach test-like images on a Steely Dan album cover with the compositional style of fashion magazine ads, with the cool of 1950s photos captured of jazz legends in their prime with elements of his design background. This eclectic brew evolved over time, with attention to the details of developing visual consistency. This ideal led the artist to paint all of the figures in black, which lent to the abstractness of the style he preferred. In addition to symbolizing the connection between the musicians, this approach allowed the statuesque players standing out amidst the spectra of background scenarios. Beginning with Traffic Jam in 1990, the series has evolved into Daniels signature style that is recognized worldwide. The musicians have been featured on television programs, commercial advertisements, film and recordings. Almost 30 years later, Daniels is still sketching out new ideas for new pieces. Although, very selective about which he paints and releases publicly. With the emergence of technologies in printing and the internet, he is now pleased to make his work more available. In addition to more original works being made available for purchase, framed and unframed open edition prints and canvases can be purchased here, with special limited edition canvases available exclusively through Darryl Daniels Artworks. Check in often for more cool stuff to come! Purchases authorized Darryl Daniels prints and canvas reproductions in a range of sizes. Featuring a choice of high-quality frames and finishes ready to jazz the walls in any room. These are canvases of works not available as open edition works. Each is digitally signed by Darryl Daniels prints offered in an edition. The current work available is Light Notes in an edition of just 375 prints. Don’t miss out! Order now! Original works by Darryl Daniels are made available at various times. These are one-of-a-kind works painted on high-quality art velum or stretched canvases. Check the availability of works released for purchase. Sign up for updates on new art releases, sales and the chance to win in our upcoming giveways. Get in on the latest now!